FLY FISHERS GUIDE TO WISCONSIN & IOWA - Tight Lines Fly Fishing Co.
John Motoviloff covers over 275 of the best flyfishing waters for trout, steelhead, salmon, smallmouth bass, northern pike, and other warmwater species in Wisconsin and northeastern Iowa. All of the major waters in Wisconsin are covered, including the Wolf River, Milwaukee, Pigeon, Sheboygan, Chippewa, Brule, Tomorrow River, Wisconsin River and many other rivers and creeks. John also covers Lake Michigan tributaries and Lake Superior tributaries. John gives a detailed description of each water, how and when to fish it, along with recommended flies. He has a number of hatch charts along with over 100 detailed maps, showing river miles, access points, boat ramps, campgrounds, and other important information. There are also over 80 great photos. John also covers a number of little-known great trout streams in eastern Iowa. Iowa also has a landowner program where private landowners allow access to their streams. John describes these waters and gives a complete listing of them. There is also a listing for fly shops and sporting good stores, guides & outfitters, accommodations, restaurants, and more. 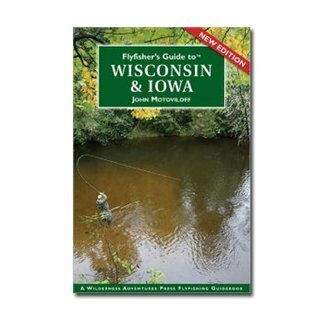 The Flyfisher’s Guide to Wisconsin and Iowa takes you to great fishing waters that get very little pressure.